La Ora Na! 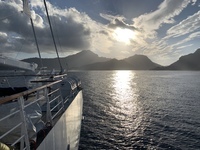 Just returned from a dream-like 10-night Tahiti & Tuamotu Island Wind Spirit Cruise. A trip to French Polynesia has been on my bucket list for many years and the time was right to celebrate our 30-year wedding anniversary. 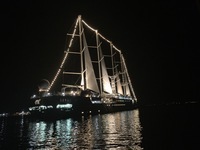 This was our third Windstar Cruise but first on a sailing ship. Everything was wonderful from the ship and the crew to the great food, fellow passengers and the beautiful islands. We loved every minute from the diving, snorkeling, beaching, Polynesian luau, Beach BBQ, cultural and scenic excursions to just being together in paradise. We left during the rainy season and so knew we were chancing some bad weather but we were very fortunate as we only had three solid cloudy and/or rainy days and 9 really good days with very little clouds and rain. It was hot and humid. Only one drift snorkeling excursion was canceled due to strong winds and current in Fakarava. A few people were sick with motion sickness at the beginning of the cruise going out to Tuamotu Islands but we took Bonine. (meclizine) and had absolutely no problems. When in the Society Islands there was very little motion and no one had any problems. We had our outgoing flight from LAX to PPT on Air Tahiti which was fine. (older plane). Upon arrival to PPT at 11 pm we took a taxi and stayed overnight at the cheaper but nice/adequate Hotel Sarah Nui. We were a five-minute walk to the Moorea Ferry dock where we bought tickets in the morning and took the first ferry to Moorea and spent the full day and night at the very nice Hilton Moorea Lagoon Resort & Spa. It was rainy and cloudy but the snorkeling in front of the resort was stunning with the water clarity, colorful coral and fish life. We took a special deal and just stayed in a garden room but it was very nice. Some of our fellow cruise passengers stayed in the over the water bungalows for the unique experience. Depends on where you want to put your vacation dollars. Took the late morning ferry back to Tahiti and literally walked off the one ferry and down the port to the Windstar which was boarding. Waited in a short line as they manually checked luggage. (different than in San Juan) but it was quick efficient and staff was very nice. Crew greeted us and escorted us to our cabin AX 205 which was very conveniently located mid ship. Though smaller than the motorized ships rooms. (Legend and Pride) it had great storage space. Did miss the large picture window. (just two port holes) but overall very nice for the smaller space. We then went to a full buffet lunch on the Veranda before heading back into Papeete to the market as my hubby had forgotten his sunglasses. We browsed and got some ideas and ended up coming back and buying a pearl necklace at the end of the cruise. We really enjoy the food on the Windstar, particularly the breakfast on the Veranda. Maybe it was our jet lag but we woke up each morning hungry and the breakfast was great. You can order special dishes from the menu. (various types of egg Benedicts, French toast, pancakes, waffles, and usually some other items). There was also an egg station where my husband had eggs over easy and they made tasty personalized omelets. Great fruits, cheeses, yogurts, bacon, sausages and various pastry. We made it back most days for lunch and then went back into the port. Dinners varied for us but we enjoyed some nights alone at a couples table. (tired after long day) but other nights we ate with others and really enjoyed talking and getting to know our fellow cruise mates. It was a very interesting mix of people. Most seemed well traveled and active and ranged in age from late 40s to late 60s. We didn’t buy the beverage package but bought reasonably priced bottles of wine to drink with dinner. There weren’t a lot of activities on board especially after dinner but we usually found we were tired after the long port days and sleep was great. We did love the deck party dinner, the Polynesian show/dinner on the private motu in Bora Bora and the lectures given by Dr. Kess on Polynesian history. We also enjoyed happy hour before dinner where we sat and talked with fellow cruisers about the day and listened to the destination manager talk about the upcoming port. Several nights we walked the deck and just looked at the glorious night sky. Captain Garciyanov came out of the bridge to show us the southern cross and constellations. He was not only approachable but approached us and other passengers’ multiple times. He was so friendly and energetic. He gave us a great bridge tour. We had just come from getting our picture taking at the bow. (think Titanic and King of the world). Fakarava: Fantasy Island came to mind as we first visited Fakarava one of the largest and most beautiful atolls (land formed by the rising reef). The extremely windy weather caused some adjustments to the plan as our drift snorkeling was cancelled but my husband was able to Drift Dive the Garuae Pass through a private company known as O2 Fakarava as he is an advanced diver. He had emailed them before we left home and arranged the dive. He had never seen so many sharks concentrated together hunting the extremely large schools of fish. The current was rapid and the water clarity pristine. He was super pumped after the dive! I took the ship’s excursion to the gorgeous but remote Blue Lagoon. The shallow waters shone in the most brilliant colors of turquoise and jade-green. As I snorkeled on my own in the lagoon, black tip reef sharks swam all around me. It was electrifying! Unfortunately the current was too strong to go to Pufuna to drift snorkel. Rangiroa: Let the adrenaline begin! 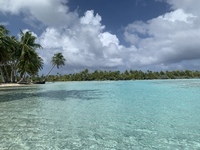 The second day, we visited Rangiroa know as the The Endless Lagoon. From there Michael and I went on a private excursion with Rangiroa Plongee. It was a drift snorkel through the famous Tiputa Pass. As we rode through 10-foot waves in our little zodiac to the ocean side of the pass, our guide said ok when we see the pod of dolphins we are all going to quickly jump into the ocean and swim with them....WHAT! ....And so, we did......TWICE!......It’s one of the moments when you can’t think too hard as the waves are crashing but there are dolphins next to your little zodiac so we dove in and the first time a whole family swam with us and the next jump was just one dolphin but she came up to me as I squeaked my hello. It was sheer joy! We then drift snorkeled through the pass to see a couple large Spotted Eagle Rays, numerous black tip reef sharks, moray eels and tons of fish. The water clarity again was suburb. We also snorkeled in the area known as the Aquarium. Michael then went on another drift dive while I took a walk and relaxed at Hotel Kira Ora resort on the beach. It was serene drinking a Pina Colada and sitting by the beach and water. Taha’ a: This is the port you need to have a ship’s excursion as they only will tender you to the private motu for a day at the beach. We did the Scenic Exploration of Taha ’a and had a fascinating experience visiting a local pearl farm and watching them harvest the pearls from the oysters. We toured the scenic island, a vanilla farm, ate some local fruit and “learned” a traditional Tahitian dance. Spent the afternoon with “ok” snorkeling around the motu. It was a very cloudy, rain off/on day. Bora Bora: Our favorite island of the trip. It’s beauty was simply stunning with luscious green mountains surrounded by a crystal clear blue and turquoise lagoon. The weather gods gave us two sunny days and we took full advantage of our short time. Fortunately, the ship spent two days at the island but I was itching for more. It had everything from water to land adventures! The first day we rented our own private dive boat with dive master,. David from H20 Bora Bora took Michael diving with manta rays and along a spectacular coral reef . In the afternoon, we all snorkeled three more spectacular sites. It was like swimming in an aquarium. We swam with a squadron of spotted eagles rays, many sharks, eels and so many beautiful fish. The water was so nice. We also had a spectacular lunch on the beach and I witnessed Michael eating two things I never thought he would. Raw fish and coconut. Poisson cru au lait de coco. It was very tasty. Great Location mid ship next to aft stairs. Huahine Nui was an island that really captured the history and culture of French Polynesia. We decided to go on a guided tour of the sacred sites with a local archeologist. In an open air Le Truck, we toured the ruins of Maeva village, a vanilla plantation and an area with 500-year-old fish traps that are still used today. The tour then ended with lovely views and the feeding of the sacred blue eels. The island was beautiful, quiet, laid back and I learned a lot about the way of life and history of the French Polynesian . It was a drift snorkel through the famous Tiputa Pass. As we rode through 10-foot waves in our little zodiac to the ocean side of the pass, our guide said ok when we see the pod of dolphins we are all going to quickly jump into the ocean and swim with them....WHAT! ....And so, we did......TWICE!......It’s one of the moments when you can’t think too hard as the waves are crashing but there are dolphins next to your little zodiac so we dove in and the first time a whole family swam with us and the next jump was just one dolphin but she came up to me as I squeaked my hello. It was sheer joy! We then drift snorkeled through the pass to see a couple large Spotted Eagle Rays, numerous black tip reef sharks, moray eels and tons of fish. The water clarity again was suburb. We also snorkeled in the area known as the Aquarium.